And so ends my “drawn much faster than normal” adaptation of H.P. Lovecraft’s The Cats of Ulthar! I enjoyed this story, simple though it is. A longer work, an original work, could be written about Lovecraft’s image of cats and their position in his universe… but how could you strike the proper tone? At least, it’d have to be more like Old Possum’s Book of Practical Cats, print edition with Edward Gorey illustrations, rather than CATS: The Musical. (I guess they’re actually pretty identical, but I just don’t want to imagine the cats as actors in makeup.) Speaking of Old Possum, imagine if T.S. Eliot and Lovecraft had met at a park petting stray felines, two writers from the same time period stylistically linked only by their love of cats — INCREDIBLE. But even S.T. 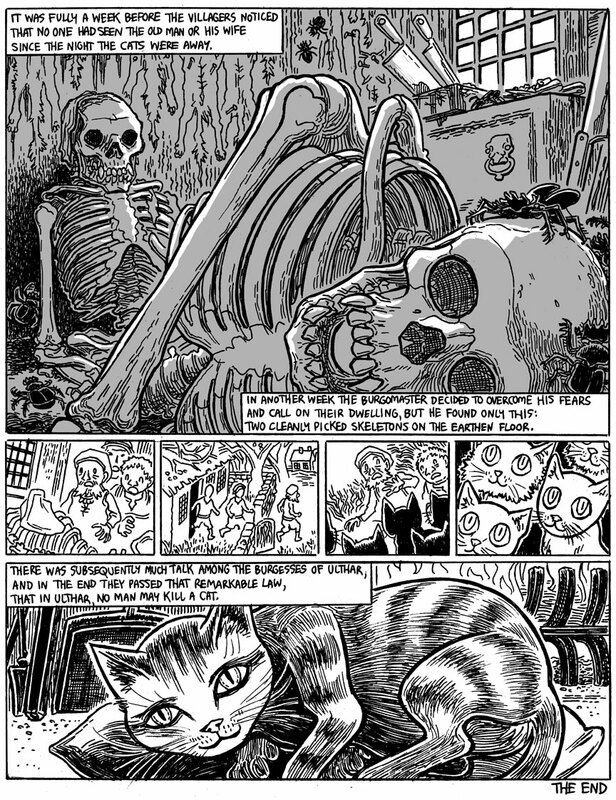 Joshi couldn’t bring himself to reprint all of Lovecraft’s cat doggerel in “I Am Providence”. Looking back, there’s one obvious artistic decision/alteration I made to this story, and that’s the depiction of the evil old couple. The fact that they have all their neighbors in mortal fear of them seemed to demand explanation, so I drew them ghoulish and ogre-like… in fact, I should’ve gone even farther. But a story in which cats eat monsters is obviously totally different from, and not as cool as, a story in which cats eat humans. By way of compromise, I suppose I’d say that they actually were human, but just very horrible, degraded humans, perhaps coarsened by their actions rather than by any innate abnormality. I like to think that the Dreamlands are a place where the definition of “human” is a little blurry and rather strange-looking individuals and communities can be found anywhere if you wander far enough. Lovecraft himself wasn’t particularly generous with or positive about the word “human” (unless he was talking about alien space cucumber things, of course). If you’d like a different, more sympathetic depiction of the old couple and their fate, there’s always this version. Anyway, thanks for reading! If you’re in the Seattle area, I’m going to be at Sakuracon this coming weekend, at Small Press booth SP-19. I’ll have a new King of RPGs mini collecting never-ever-before-seen sketches & backstory on the King of RPGs game universe, so come check it out! The last few weeks have been super busy doing artwork for a big project which should be going online soon; I’ll link to it when it’s up. And I’ll be getting you some new comics shortly. See you soon! I like this story as well. Nice job! It is short but satisfying, and the art is good enough (along with some really great, detailed portions, like the skeletons on the last page). The teeth look linger when there are no gums to hide them. Not really longer. When it came down to it a cat can be trusted over a zoog any time including honoring treaties. And remember zoog territory overlaps with the waking world in two places on the earth. Nicely done for “quick work” I must say. Short and satisfying to me. I’m sure HPL and TSE would have had a nice chat as long as HPL’s parody of “The Wastelands” didn’t come up in the conversation. Thank you very much for this, and all of your adaptations! Even your quick stuff is better than many artists’ best work. So much subtle detail (e.g. the catskins tacked to the wall). I’d love to see you do more quick ones like this, perhaps some minor stories you don’t think are worth taking a lot of effort on. I love this. Good artwork plus Lovecraft stories is an unbeatable combination. The scene where Menes loses his kitten is even more heartbreaking when illustrated. A fantastic adaptation. I can’t believe it only took a few days.